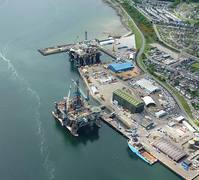 Semco Maritime has completed a winterisation provisioning on a Noble jackup for a future deployment to a cold-weather climate. The order follows an exclusive partnership agreement with offshore winterisation supplier Advanced Mat Systems (AMS). The winterisation work was completed at Semco Maritime’s Queens Dock facility at Invergordon, Scotland. The work includes, amongst other things, Arctic Pads©, heat tracing and insulation, injector head skidding systems, installation of various fluid transfer systems as well as enhancing pollution control measures. The highly specialised job has been conducted by a 100-man project team collated from Semco Maritime departments all over the world, mainly United States, Denmark and the UK. “Semco Maritime’s installation of Arctic Pads© provides a modernised solution to the challenge of providing a durable, non-slip surface for cold environments,” says Project Director Hatem Elgamiel, Noble Drilling Services Inc.
“We are pleased that Noble Corporation has chosen us for this complex scope of work. Winterisation rig-upgrade and maintenance is a highly specialised area, which demands deep knowledge and experience in order to deliver upgraded rigs that are durable and safe in cold regions,” says Senior Vice President Lars Skov, Semco Maritime Rig Projects. The upgrade project has also formed a new partnership in the industry: Advanced Mat Systems Inc. and Semco Maritime have entered into an exclusive cooperation agreement with a view to strengthen both companies’ growing interest in winterisation of rigs as well as other offshore installations developed for operations in cold regions. Under the cooperation agreement, Advanced Mat System will deliver winterisation equipment while Semco Maritime conducts surveys and performs project management, including installation. Semco Maritime will hold exclusive rights to buy Advanced Mat Systems state of the art offshore winterisation equipment in specific markets. The agreement also sets a common goal to improve the effectiveness of winterisation measures, ensuring that offshore installations are capable or suitably prepared to operate in cold climates and adhere to the International Maritime Organization IMO’s “Polar Code” requirement and Class Society Winterization Notations and Standards. “To Semco Maritime, this agreement underlines our commitment to go that ‘extra mile’ to secure the best possible solutions for our customers, along with our facility, track record and expertise in upgrading rigs in the North Sea,” says Lars Skov. “As for AMS it is quite simple, AMS is a leading manufacturer of winterisation solutions and equipment, Semco Maritime is the nerve centre, muscle and expertise that drilling contractors and operators trust and rely on globally. This cooperation allows us as a network to provide the most comprehensive winterisation solution, service and support package available anywhere in the world today,” says JP Hawkins, President and CEO, Advanced Mat Systems Inc.